As a pilot, it is important to stay aware of the mental and physical standards required for the type of flying done. This page provides information on medical certification and on aeromedical factors related to flying activities. Most pilots must have a valid medical certificate to exercise the privileges of their airman certificates. Glider and free balloon pilots are not required to hold a medical certificate. Sport pilots may hold either a medical certificate or a valid state driver’s license. To acquire a medical certificate, an examination by an aviation medical examiner (AME), a physician with training in aviation medicine designated by the Civil Aerospace Medical Institute (CAMI), is required. There are three classes of medical certificates. The class of certificate needed depends on the type of flying the pilot plans to do. A third-class medical is required for a private or recreational pilot certificate. It is valid for 3 years for those individuals who have not reached the age of 40; otherwise it is valid for 2 years. A commercial pilot certificate requires at least a second-class medical certificate, which is valid for 1 year. First-class medical certificates are required for airline transport pilots, and are valid for 6 months. The standards are more rigorous for the higher classes of certificates. A pilot with a higher class medical certificate has met the requirements for the lower classes as well. Since the class of medical required applies only when exercising the privileges of the pilot certificate for which it is required, a first-class medical would be valid for 1 year if exercising the privileges of a commercial certificate, and 2 or 3 years, as appropriate, for exercising the privileges of a private or recreational certificate. The same applies for a second-class medical certificate. The standards for medical certification are contained in Title 14 of the Code of Federal Regulations (14 CFR) part 67, and the requirements for obtaining medical certificates are in 14 CFR part 61. Students who have physical limitations, such as impaired vision, loss of a limb, or hearing impairment may be issued a medical certificate valid for “student pilot privileges only” while they are learning to fly. Pilots with disabilities may require special equipment installed in the airplane, such as hand controls for pilots with paraplegia. Some disabilities necessitate a limitation on the individual’s certificate; for example, impaired hearing would require the limitation “not valid for flight requiring the use of radio.” When all the knowledge, experience, and proficiency requirements have been met and a student can demonstrate the ability to operate the airplane with the normal level of safety, a “statement of demonstrated ability” (SODA) can be issued. This waiver or SODA is valid as long as their physical impairment does not worsen. Contact the local Flight Standards District Office (FSDO) for more information on this subject. A number of health factors and physiological effects can be linked to flying. Some are minor, while others are important enough to require special attention to ensure safety of flight. In some cases, physiological factors can lead to in-flight emergencies. Some important medical factors that a pilot should be aware of include hypoxia, hyperventilation, middle ear and sinus problems, spatial disorientation, motion sickness, carbon monoxide poisoning, stress and fatigue, dehydration, and heatstroke. Other subjects include the effects of alcohol and drugs, anxiety, and excess nitrogen in the blood after scuba diving. Hypoxia means “reduced oxygen” or “not enough oxygen.” Although any tissue will die if deprived of oxygen long enough, usually the most concern is with getting enough oxygen to the brain, since it is particularly vulnerable to oxygen deprivation. Any reduction in mental function while flying can result in life-threatening errors. Hypoxia can be caused by several factors including an insufficient supply of oxygen, inadequate transportation of oxygen, or the inability of the body tissues to use oxygen. The forms of hypoxia are divided into four major groups based on their causes: hypoxic hypoxia, hypemic hypoxia, stagnant hypoxia, and histotoxic hypoxia. Hypoxic hypoxia is a result of insufficient oxygen available to the lungs. A blocked airway or drowning are obvious examples of how the lungs can be deprived of oxygen, but the reduction in partial pressure of oxygen at high altitude is an appropriate example for pilots. Although the percentage of oxygen in the atmosphere is constant, its partial pressure decreases proportionately as atmospheric pressure decreases. As the airplane ascends during flight, the percentage of each gas in the atmosphere remains the same, but there are fewer molecules available at the pressure required for them to pass between the membranes in the respiratory system. This decrease of oxygen molecules at sufficient pressure can lead to hypoxic hypoxia. This occurs when the blood is not able to take up and transport a sufficient amount of oxygen to the cells in the body. Hypemic means “not enough blood.” This type of hypoxia is a result of oxygen deficiency in the blood, rather than a lack of inhaled oxygen, and can be caused by a variety of factors. It may be because there is not enough blood volume (due to severe bleeding), or may result from certain blood diseases, such as anemia. More often it is because hemoglobin, the actual blood molecule that transports oxygen, is chemically unable to bind oxygen molecules. The most common form of hypemic hypoxia is carbon monoxide poisoning. Hypemic hypoxia also can be caused by the loss of blood from a blood donation. Blood can take several weeks to return to normal following a donation. Although the effects of the blood loss are slight at ground level, there are risks when flying during this time. Stagnant means “not flowing,” and stagnant hypoxia results when the oxygen-rich blood in the lungs isn’t moving, for one reason or another, to the tissues that need it. An arm or leg going to sleep because the blood flow has accidentally been shut off is one form of stagnant hypoxia. This kind of hypoxia can also result from shock, the heart failing to pump blood effectively, or a constricted artery. During flight, stagnant hypoxia can occur when pulling excessive positive Gs. Cold temperatures also can reduce circulation and decrease the blood supplied to extremities. The inability of the cells to effectively use oxygen is defined as histotoxic hypoxia. “Histo” refers to tissues or cells, and “toxic” means poison. In this case, plenty of oxygen is being transported to the cells that need it, but they are unable to make use of it. This impairment of cellular respiration can be caused by alcohol and other drugs, such as narcotics and poisons. Research has shown that drinking one ounce of alcohol can equate to about an additional 2,000 feet of physiological altitude. As hypoxia worsens, the field of vision begins to narrow, and instrument interpretation can become difficult. Even with all these symptoms, the effects of hypoxia can cause a pilot to have a false sense of security and be deceived into believing that everything is normal. The treatment for hypoxia includes flying at lower altitudes and/or using supplemental oxygen. All pilots are susceptible to the effects of oxygen starvation, regardless of physical endurance or acclimatization. When flying at high altitudes, it is paramount that oxygen be used to avoid the effects of hypoxia. The term “time of useful consciousness” describes the maximum time the pilot has to make rational, life-saving decisions and carry them out at a given altitude without supplemental oxygen. As altitude increases above 10,000 feet, the symptoms of hypoxia increase in severity, and the time of useful consciousness rapidly decreases. Figure 1: Time of useful consciousness. Hyperventilation occurs when an individual is experiencing emotional stress, fright, or pain, and the breathing rate and depth increase, although the carbon dioxide level in the blood is already at a reduced level. The result is an excessive loss of carbon dioxide from the body, which can lead to unconsciousness due to the respiratory system’s overriding mechanism to regain control of breathing. Pilots encountering an unexpected stressful situation may unconsciously increase their breathing rate. If flying at higher altitudes, either with or without oxygen, a pilot may have a tendency to breathe more rapidly than normal, which often leads to hyperventilation. Since many of the symptoms of hyperventilation are similar to those of hypoxia, it is important to correctly diagnose and treat the proper condition. If using supplemental oxygen, check the equipment and flow rate to ensure the symptoms are not hypoxia related. Hyperventilation may produce a pale, clammy appearance and muscle spasms compared to the cyanosis and limp muscles associated with hypoxia. Climbs and descents can sometimes cause ear or sinus pain and a temporary reduction in the ability to hear. The middle ear is a small cavity located in the bone of the skull. It is closed off from the external ear canal by the eardrum. Normally, pressure differences between the middle ear and the outside world are equalized by a tube leading from inside each ear to the back of the throat on each side, called the eustachian tube. These tubes are usually closed, but open during chewing, yawning, or swallowing to equalize pressure. Even a slight difference between external pressure and middle ear pressure can cause discomfort. Figure 2: The eustachian tube allows air pressure to equalize in the middle ear. During a climb, middle ear air pressure may exceed the pressure of the air in the external ear canal, causing the eardrum to bulge outward. Pilots become aware of this pressure change when they experience alternate sensations of “fullness” and “clearing.” During descent, the reverse happens. While the pressure of the air in the external ear canal increases, the middle ear cavity, which equalized with the lower pressure at altitude, is at lower pressure than the external ear canal. This results in the higher outside pressure, causing the eardrum to bulge inward. This condition can be more difficult to relieve due to the fact that the partial vacuum tends to constrict the walls of the eustachian tube. To remedy this often painful condition, which also causes a temporary reduction in hearing sensitivity, pinch the nostrils shut, close the mouth and lips, and blow slowly and gently in the mouth and nose. This procedure forces air through the eustachian tube into the middle ear. It may not be possible to equalize the pressure in the ears if a pilot has a cold, an ear infection, or sore throat. A flight in this condition can be extremely painful, as well as damaging to the eardrums. If experiencing minor congestion, nose drops or nasal sprays may reduce the chance of a painful ear blockage. Before using any medication, check with an aviation medical examiner to ensure that it will not affect the ability to fly. In a similar way, air pressure in the sinuses equalizes with the pressure in the cockpit through small openings that connect the sinuses to the nasal passages. An upper respiratory infection, such as a cold or sinusitis, or a nasal allergic condition can produce enough congestion around an opening to slow equalization. As the difference in pressure between the sinus and the cockpit increases, congestion may plug the opening. This “sinus block” occurs most frequently during descent. Slow descent rates can reduce the associated pain. A sinus block can occur in the frontal sinuses, located above each eyebrow, or in the maxillary sinuses, located in each upper cheek. It will usually produce excruciating pain over the sinus area. A maxillary sinus block can also make the upper teeth ache. Bloody mucus may discharge from the nasal passages. Sinus block can be avoided by not flying with an upper respiratory infection or nasal allergic condition. Adequate protection is usually not provided by decongestant sprays or drops to reduce congestion around the sinus openings. Oral decongestants have side effects that can impair pilot performance. If a sinus block does not clear shortly after landing, a physician should be consulted. Spatial disorientation specifically refers to the lack of orientation with regard to the position, attitude, or movement of the airplane in space. The body uses three integrated systems working together to ascertain orientation and movement in space. The eye is by far the largest source of information. Kinesthesia refers to the sensation of position, movement, and tension perceived through the nerves, muscles, and tendons. The vestibular system is a very sensitive motion sensing system located in the inner ears. It reports head position, orientation, and movement in three-dimensional space. All this information comes together in the brain, and most of the time, the three streams of information agree, giving a clear idea of where and how the body is moving. Flying can sometimes cause these systems to supply conflicting information to the brain, which can lead to disorientation. During flight in visual meteorological conditions (VMC), the eyes are the major orientation source and usually prevail over false sensations from other sensory systems. When these visual cues are taken away, as they are in instrument meteorological conditions (IMC), false sensations can cause a pilot to quickly become disoriented. The vestibular system in the inner ear allows the pilot to sense movement and determine orientation in the surrounding environment. In both the left and right inner ear, three semicircular canals are positioned at approximate right angles to each other. Each canal is filled with fluid and has a section full of fine hairs. Acceleration of the inner ear in any direction causes the tiny hairs to deflect, which in turn stimulates nerve impulses, sending messages to the brain. The vestibular nerve transmits the impulses from the utricle, saccule, and semicircular canals to the brain to interpret motion. Figure 3: The semicircular canals lie in three planes, and sense motions of roll, pitch, and yaw. The postural system sends signals from the skin, joints, and muscles to the brain that are interpreted in relation to the earth’s gravitational pull. These signals determine posture. Inputs from each movement update the body’s position to the brain on a constant basis. “Seat of the pants” flying is largely dependent upon these signals. Used in conjunction with visual and vestibular clues, these sensations can be fairly reliable. However, the body cannot distinguish between acceleration forces due to gravity and those resulting from maneuvering the aircraft, which can lead to sensory illusions and false impressions of the airplane’s orientation and movement. Under normal flight conditions, when there is a visual reference to the horizon and ground, the sensory system in the inner ear helps to identify the pitch, roll, and yaw movements of the airplane. When visual contact with the horizon is lost, the vestibular system becomes unreliable. Without visual references outside the airplane, there are many situations where combinations of normal motions and forces can create convincing illusions that are difficult to overcome. In a classic example, a pilot may believe the airplane is in level flight, when, in reality, it is in a gradual turn. If the airspeed increases, the pilot may experience a postural sensation of a level dive and pull back on the stick, which tightens the turn and creates increasing G-loads. If recovery is not initiated, a steep spiral will develop. This is sometimes called the graveyard spiral, because if the pilot fails to recognize that the airplane is in a spiral and fails to return the airplane to wings-level flight, the airplane will eventually strike the ground. If the horizon becomes visible again, the pilot will have an opportunity to return the airplane to straight-and-level flight, and continued visual contact with the horizon will allow the pilot to maintain straight-and-level flight. However, if contact with the horizon is lost again, the inner ear may fool the pilot into thinking the airplane has started a bank in the other direction, causing the graveyard spiral to begin all over again. Prevention is usually the best remedy for spatial disorientation. Unless a pilot has many hours of training in instrument flight, flight in reduced visibility or at night when the horizon is not visible should be avoided. A pilot can reduce susceptibility to disorienting illusions through training and awareness, and learning to rely totally on flight instruments. Besides the sensory illusions due to misleading inputs to the vestibular system, a pilot may also encounter various visual illusions during flight. Illusions rank among the most common factors cited as contributing to fatal airplane accidents. Sloping cloud formations, an obscured horizon, a dark scene spread with ground lights and stars, and certain geometric patterns of ground light can create illusions of not being aligned correctly with the actual horizon. Various surface features and atmospheric conditions encountered in landing can create illusions of being on the wrong approach path. Landing errors from these illusions can be prevented by anticipating them during approaches, inspecting unfamiliar airports before landing, using electronic glide slope or VASI systems when available, and maintaining proficiency in landing procedures. A narrower-than-usual runway can create the illusion that the airplane is higher than it actually is, while a wider-than-usual runway can have the opposite effect, causing the pilot to flare too high or overshoot the runway. A runway that slopes up, or upsloping terrain, can create the illusion that the airplane is at a higher altitude than it actually is, and downsloping runways or terrain can create the opposite effect. Rain on the windshield can create the illusion of greater height, and haze can make distances appear greater than they are. At sunrise or sunset, a pilot may encounter flicker vertigo. In some individuals, flashing lights at certain frequencies can trigger seizures, nausea, convulsions, or unconsciousness. Seeing the sun through a slowmoving propeller can produce the effect of a flashing light. So can bright light reflecting off the back of the propeller. Symptoms are rare, but be aware of the possibility. It is important to remember that experiencing airsickness is no reflection on one’s ability as a pilot. If prone to motion sickness, let the flight instructor know since there are techniques that can be used to overcome this problem. For example, avoid lessons in turbulent conditions until becoming more comfortable in the airplane, or start with shorter flights and graduate to longer instruction periods. If symptoms of motion sickness are experienced during a lesson, opening fresh air vents, focusing on objects outside the airplane, and avoiding unnecessary head movements may help alleviate some of the discomfort. Although medications like Dramamine can prevent airsickness in passengers, they are not recommended while flying since they can cause drowsiness and other problems. Carbon monoxide (CO) is a colorless and odorless gas produced by all internal combustion engines. Since it attaches itself to the hemoglobin in the blood about 200 times more easily than oxygen, carbon monoxide prevents the hemoglobin from carrying oxygen to the cells, resulting in hypemic hypoxia. It can take up to 48 hours for the body to dispose of carbon monoxide. If the poisoning is severe enough, it can result in death. Aircraft heater vents and defrost vents may provide carbon monoxide a passageway into the cabin, particularly if the engine exhaust system has a leak or is damaged. If a strong odor of exhaust gases is detected, assume that carbon monoxide is present. However, carbon monoxide may be present in dangerous amounts even if no exhaust odor is detected. Disposable, inexpensive carbon monoxide detectors are widely available. In the presence of carbon monoxide, these detectors change color to alert the pilot of the presence of carbon monoxide. Some effects of carbon monoxide poisoning include headache, blurred vision, dizziness, drowsiness, and/or loss of muscle power. Anytime a pilot smells exhaust odor, or any time that these symptoms are experienced, immediate corrective actions should be taken. These include turning off the heater, opening fresh air vents and windows, and using supplemental oxygen, if available. Tobacco smoke also causes carbon monoxide poisoning. Smoking at sea level can raise the CO concentration in the blood and result in physiological effects similar to flying at 8,000 feet. Besides hypoxia, tobacco causes diseases and physiological debilitation that are medically disqualifying for pilots. Stress is defined as the body’s response to physical and psychological demands placed upon it. The body’s reaction to stress includes releasing chemical hormones (such as adrenaline) into the blood, and increasing metabolism to provide more energy to the muscles. The blood sugar, heart rate, respiration, blood pressure, and perspiration all increase. The term “stressor” is used to describe an element that causes an individual to experience stress. Examples of stressors include physical stress (noise or vibration), physiological stress (fatigue), and psychological stress (difficult work or personal situations). Stress falls into two broad categories, including acute stress (short term) and chronic stress (long term). Acute stress involves an immediate threat that is perceived as danger. This is the type of stress that triggers a “fight or flight” response in an individual, whether the threat is real or imagined. Normally, a healthy person can cope with acute stress and prevent stress overload. However, on-going acute stress can develop into chronic stress. Fatigue is frequently associated with pilot error. Some of the effects of fatigue include degradation of attention and concentration, impaired coordination, and decreased ability to communicate. These factors can seriously influence the ability to make effective decisions. Physical fatigue can result from sleep loss, exercise, or physical work. Factors such as stress and prolonged performance of cognitive work can result in mental fatigue. Like stress, fatigue also falls into two broad categories: acute and chronic. Acute fatigue is short term and is a normal occurrence in everyday living. It is the kind of tiredness people feel after a period of strenuous effort, excitement, or lack of sleep. Rest after exertion and 8 hours of sound sleep ordinarily cures this condition. Timing disruption Appearing to perform a task as usual, but the timing of each component is slightly off. This makes the pattern of the operation less smooth, because the pilot performs each component as though it were separate, instead of part of an integrated activity. Disruption of the perceptual field Concentrating attention upon movements or objects in the center of vision and neglecting those in the periphery. This may be accompanied by loss of accuracy and smoothness in control movements. Acute fatigue can be prevented by a proper diet and adequate rest and sleep. A well-balanced diet prevents the body from having to consume its own tissues as an energy source. Adequate rest maintains the body’s store of vital energy. Chronic fatigue, extending over a long period of time, usually has psychological roots, although an underlying disease is sometimes responsible. Continuous high stress levels, for example, can produce chronic fatigue. Chronic fatigue is not relieved by proper diet and adequate rest and sleep, and usually requires treatment by a physician. An individual may experience this condition in the form of weakness, tiredness, palpitations of the heart, breathlessness, headaches, or irritability. Sometimes chronic fatigue even creates stomach or intestinal problems and generalized aches and pains throughout the body. When the condition becomes serious enough, it can lead to emotional illness. If suffering from acute fatigue, stay on the ground. If fatigue occurs in the cockpit, no amount of training or experience can overcome the detrimental effects. Getting adequate rest is the only way to prevent fatigue from occurring. Avoid flying without a full night’s rest, after working excessive hours, or after an especially exhausting or stressful day. Pilots who suspect they are suffering from chronic fatigue should consult a physician. Dehydration is the term given to a critical loss of water from the body. The first noticeable effect of dehydration is fatigue, which in turn makes top physical and mental performance difficult, if not impossible. As a pilot, flying for long periods in hot summer temperatures or at high altitudes increases the susceptibility of dehydration since the dry air at altitude tends to increase the rate of water loss from the body. If this fluid is not replaced, fatigue progresses to dizziness, weakness, nausea, tingling of hands and feet, abdominal cramps, and extreme thirst. Heatstroke is a condition caused by any inability of the body to control its temperature. Onset of this condition may be recognized by the symptoms of dehydration, but also has been known to be recognized only by complete collapse. To prevent these symptoms, it is recommended that an ample supply of water be carried and used at frequent intervals on any long flight, whether thirsty or not. If the airplane has a canopy or roof window, wearing light-colored, porous clothing and a hat will help provide protection from the sun. Keeping the cockpit well ventilated aids in dissipating excess heat. Alcohol impairs the efficiency of the human mechanism. Studies have positively proven that drinking and performance deterioration are closely linked. Pilots must make hundreds of decisions, some of them time-critical, during the course of a flight. The safe outcome of any flight depends on the ability to make the correct decisions and take the appropriate actions during routine occurrences, as well as abnormal situations. The influence of alcohol drastically reduces the chances of completing a flight without incident. Even in small amounts, alcohol can impair judgment, decrease sense of responsibility, affect coordination, constrict visual field, diminish memory, reduce reasoning power, and lower attention span. As little as one ounce of alcohol can decrease the speed and strength of muscular reflexes, lessen the efficiency of eye movements while reading, and increase the frequency at which errors are committed. Impairments in vision and hearing occur at alcohol blood levels as low as .01 percent. The alcohol consumed in beer and mixed drinks is ethyl alcohol, a central nervous system depressant. From a medical point of view, it acts on the body much like a general anesthetic. The “dose” is generally much lower and more slowly consumed in the case of alcohol, but the basic effects on the system are similar. Alcohol is easily and quickly absorbed by the digestive tract. The bloodstream absorbs about 80 to 90 percent of the alcohol in a drink within 30 minutes on an empty stomach. The body requires about 3 hours to rid itself of all the alcohol contained in one mixed drink or one beer. With a hangover, a pilot is still under the influence of alcohol. Although a pilot may think that he or she is functioning normally, the impairment of motor and mental responses still remains. Considerable amounts of alcohol can remain in the body for over 16 hours, so pilots should be cautious about flying too soon after drinking. Altitude multiplies the effects of alcohol on the brain. When combined with altitude, the alcohol from two drinks may have the same effect as three or four drinks. Alcohol interferes with the brain’s ability to utilize oxygen, producing a form of histotoxic hypoxia. The effects are rapid because alcohol passes so quickly into the bloodstream. In addition, the brain is a highly vascular organ that is immediately sensitive to changes in the blood’s composition. For a pilot, the lower oxygen availability at altitude, along with the lower capability of the brain to use what oxygen is there, adds up to a deadly combination. Intoxication is determined by the amount of alcohol in the bloodstream. This is usually measured as a percentage by weight in the blood. 14 CFR part 91 requires that blood alcohol level be less than .04 percent and that 8 hours pass between drinking alcohol and piloting an airplane. A pilot with a blood alcohol level of .04 percent or greater after 8 hours cannot fly until the blood alcohol falls below that amount. Even though blood alcohol may be well below .04 percent, a pilot cannot fly sooner than 8 hours after drinking alcohol. Pilot performance can be seriously degraded by both prescribed and over-the-counter medications, as well as by the medical conditions for which they are taken. Many medications, such as tranquilizers, sedatives, strong pain relievers, and cough-suppressants have primary effects that may impair judgment, memory, alertness, coordination, vision, and the ability to make calculations. Others, such as antihistamines, blood pressure drugs, muscle relaxants, and agents to control diarrhea and motion sickness have side effects that may impair the same critical functions. Any medication that depresses the nervous system, such as a sedative, tranquilizer, or antihistamine can make a pilot more susceptible to hypoxia. Pain-killers can be grouped into two broad categories: analgesics and anesthetics. Analgesics are drugs that reduce pain, while anesthetics are drugs that deaden pain or cause loss of consciousness. Over-the-counter analgesics, such as acetylsalicylic acid (Aspirin), acetaminophen (Tylenol), and ibuprofen (Advil) have few side effects when taken in the correct dosage. Although some people are allergic to certain analgesics or may suffer from stomach irritation, flying usually is not restricted when taking these drugs. However, flying is almost always precluded while using prescription analgesics, such as Darvon, Percodan, Demerol, and codeine since these drugs may cause side effects such as mental confusion, dizziness, headaches, nausea, and vision problems. Anesthetic drugs are commonly used for dental and surgical procedures. Most local anesthetics used for minor dental and outpatient procedures wear off within a relatively short period of time. The anesthetic itself may not limit flying so much as the actual procedure and subsequent pain. Stimulants are drugs that excite the central nervous system and produce an increase in alertness and activity. Amphetamines, caffeine, and nicotine are all forms of stimulants. Common uses of these drugs include appetite suppression, fatigue reduction, and mood elevation. Some of these drugs may cause a stimulant reaction, even though this reaction is not their primary function. In some cases, stimulants can produce anxiety and mood swings, both of which are dangerous when flying. Depressants are drugs that reduce the body’s functioning in many areas. These drugs lower blood pressure, reduce mental processing, and slow motor and reaction responses. There are several types of drugs that can cause a depressing effect on the body, including tranquilizers, motion sickness medication, some types of stomach medication, decongestants, and antihistamines. The most common depressant is alcohol. Some drugs, which can neither be classified as stimulants nor depressants, have adverse effects on flying. For example, some forms of antibiotics can produce dangerous side effects, such as balance disorders, hearing loss, nausea, and vomiting. While many antibiotics are safe for use while flying, the infection requiring the antibiotic may prohibit flying. In addition, unless specifically prescribed by a physician, do not take more than one drug at a time, and never mix drugs with alcohol, because the effects are often unpredictable. The dangers of illegal drugs also are well documented. Certain illegal drugs can have hallucinatory effects that occur days or weeks after the drug is taken. Obviously, these drugs have no place in the aviation community. The Code of Federal Regulations prohibits pilots from performing crewmember duties while using any medication that affects the faculties in any way contrary to safety. The safest rule is not to fly as a crewmember while taking any medication, unless approved to do so by the FAA. If there is any doubt regarding the effects of any medication, consult an aviation medical examiner before flying. Scuba diving subjects the body to increased pressure, which allows more nitrogen to dissolve in body tissues and fluids. The reduction of atmospheric pressure that accompanies flying can produce physical problems for scuba divers. Reducing the pressure too quickly allows small bubbles of nitrogen to form inside the body as the gas comes out of solution. These bubbles can cause a painful and potentially incapacitating condition called “the bends.” (An example is dissolved gas forming bubbles as pressure decreases by slowly opening a transparent bottle of soda.) Scuba training emphasizes how to prevent the bends when rising to the surface, but increased nitrogen concentrations can remain in tissue fluids for several hours after a diver leaves the water. The bends can be experienced from as low as 8,000 feet MSL, with increasing severity as altitude increases. As noted in the Aeronautical Information Manual (AIM), the minimum recommended time between scuba diving on nondecompression stop dives and flying is 12 hours, while the minimum time recommended between decompression stop diving and flying is 24 hours. 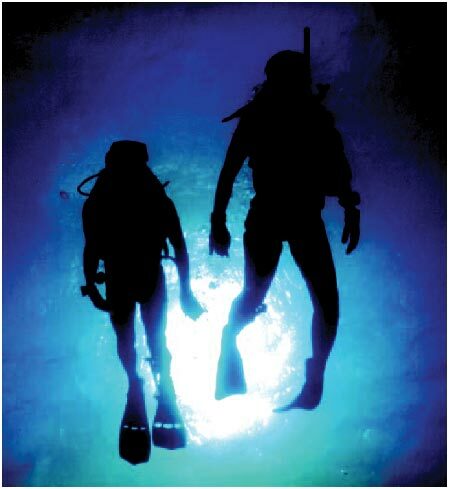 Figure 5: Scuba divers must not fly for specific time periods following dives to avoid the bends. Of all the senses, vision is the most important for safe flight. Most of the things perceived while flying are visual or heavily supplemented by vision. As remarkable and vital as it is, vision is subject to some limitations, such as illusions and blind spots. The more a pilot understands about the eyes and how they function, the easier it is to use vision effectively and compensate for potential problems. The eye functions much like a camera. Its structure includes an aperture, a lens, a mechanism for focusing, and a surface for registering images. Light enters through the cornea at the front of the eyeball, travels through the lens and falls on the retina. The retina contains light sensitive cells that convert light energy into electrical impulses that travel through nerves to the brain. The brain interprets the electrical signals to form images. There are two kinds of light sensitive cells in the eyes: rods and cones. The cones are responsible for all color vision, from appreciating a glorious sunset to discerning the subtle shades in a fine painting. Cones are present throughout the retina, but are concentrated toward the center of the field of vision at the back of the retina. There is a small pit called the fovea where almost all the light sensing cells are cones. This is the area where most “looking” occurs (the center of the visual field where detail, color sensitivity, and resolution are highest). While the cones and their associated nerves are well suited to detecting fine detail and color in high light levels, the rods are better able to detect movement and provide vision in dim light. The rods are unable to discern color but are very sensitive in low light levels. The trouble with rods is that a large amount of light overwhelms them, and they take a long time to “reset” and adapt to the dark again. There are so many cones in the fovea that the very center of the visual field hardly has any rods at all. So in low light, the middle of the visual field isn’t very sensitive, but farther from the fovea, the rods are more numerous and provide the major portion of night vision. Figure 7: The eye’s blind spot. The area where the optic nerve enters the eyeball has no rods or cones, leaving a blind spot in the field of vision. Normally, each eye compensates for the other’s blind spot. Figure 7 provides a dramatic example of the eye’s blind spot. Cover the right eye and hold this page at arm’s length. Focus the left eye on the X in the right side of the windshield and notice what happens to the airplane while slowly bringing the page closer to the eye. Another problem associated with flying at night, in instrument meteorological conditions and/or reduced visibility is empty-field myopia, or induced nearsightedness. With nothing to focus on, the eyes automatically focus on a point just slightly ahead of the airplane. Searching out and focusing on distant light sources, no matter how dim, helps prevent the onset of empty-field myopia. Figure 8: Night blind spot. When looking directly at an object, the image is focused mainly on the fovea, where detail is best seen. At night, the ability to see an object in the center of the visual field is reduced as the cones lose much of their visual acuity and the rods become more sensitive. Looking off center can help compensate for this night blind spot. Along with the loss of sharpness and color at night, depth perception and judgment of size may be lost. While the cones adapt rapidly to changes in light intensities, the rods take much longer. Walking from bright sunlight into a dark movie theater is an example of this dark adaptation period experience. The rods can take approximately 30 minutes to fully adapt to the dark. A bright light, however, can completely destroy night adaptation, leaving night vision severely compromised while the adaptation process is repeated. Several things can be done to keep the eyes adapted to the dark. The first is obvious: avoid bright lights before and during the flight. For 30 minutes before a night flight, avoid any bright light sources, such as headlights, landing lights, strobe lights, or flashlights. If a bright light is encountered, close one eye to keep it light sensitive. This allows the use of that eye to see again once the light is gone. Red cockpit lighting also helps preserve night vision, but red light severely distorts some colors and completely washes out the color red. This makes reading an aeronautical chart difficult. A dim white light or a carefully directed flashlight can enhance night reading ability. While flying at night, keep the instrument panel and interior lights turned up no higher than necessary. This helps to see outside references more easily. If the eyes become blurry, blinking more frequently often helps. Diet and general physical health have an impact on how well a pilot can see in the dark. Deficiencies in vitamins A and C have been shown to reduce night acuity. Other factors, such as carbon monoxide poisoning, smoking, alcohol, certain drugs, and a lack of oxygen also can greatly decrease night vision. There are many different types of visual illusions that commonly occur at night. Anticipating and staying aware of them is usually the best way to avoid them. Autokinesis is caused by staring at a single point of light against a dark background for more than a few seconds. After a few moments, the light appears to move on its own. To prevent this illusion, focus the eyes on objects at varying distances and avoid fixating on one target. Be sure to maintain a normal scan pattern. A false horizon can occur when the natural horizon is obscured or not readily apparent. It can be generated by confusing bright stars and city lights. It can also occur while flying toward the shore of an ocean or a large lake. Because of the relative darkness of the water, the lights along the shoreline can be mistaken for stars in the sky. Figure 9: At night, the horizon may be hard to discern due to dark terrain and misleading light patterns on the ground. Landing illusions occur in many forms. Above featureless terrain at night, there is a natural tendency to fly a lower-than-normal approach. Elements that cause any type of visual obscuration, such as rain, haze, or a dark runway environment also can cause low approaches. Bright lights, steep surrounding terrain, and a wide runway can produce the illusion of being too low, with a tendency to fly a higher-than-normal approach. Often a set of regularly spaced lights along a road or highway can appear to be runway lights. Pilots have even mistaken the lights on moving trains as runway or approach lights. Bright runway or approach lighting systems can create the illusion that the airplane is closer to the runway, especially where few lights illuminate the surrounding terrain. This concludes the Aeromedical Factors page. You may now check your knowledge at the FAA Flight Operations test question data base or go on to the Aviation Weather Principles page.